prepares for the upcoming DG Expo in New York City. and the show is getting closer! to allow them to see our new fabric. So do not worry! 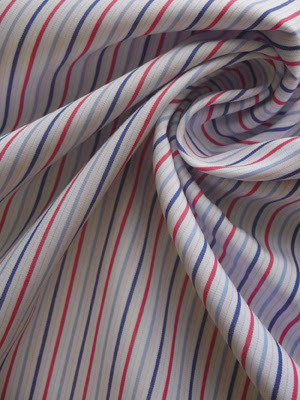 Going to a show is not the only way you can check out our wholesale fabric. Make sure you check out our wholesale website for more information! New fabric for the show! 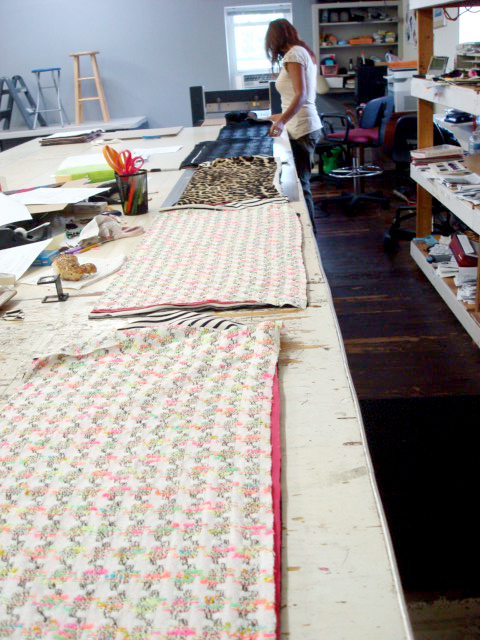 Gabby prepares the fabric to be cut into swatches. 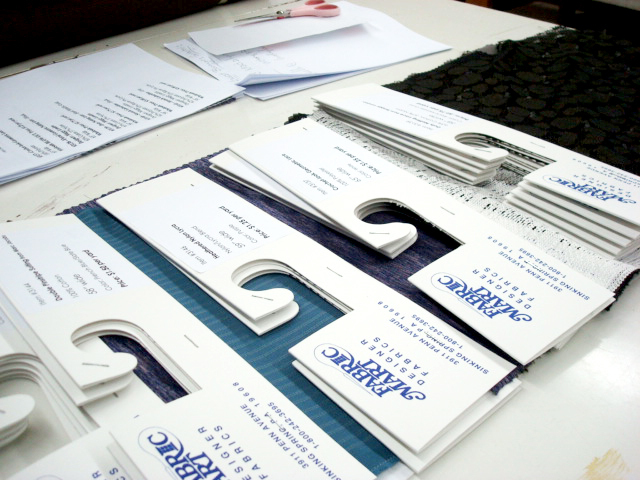 Our samples ready for mailers. Getting the headers ready for the show. Just a portion of our wall of headers that we will be taking with us to NY! the owner of Fabric Mart! The store front from when our current location in Sinking Spring, PA was just opened and the store front today. It is so easy to shop on the Fabric Mart website-- a few clicks of the mouse and in a few days a box of beautiful fabrics arrive at your door. But how did this business start? Fabric Mart was started in July 1977 by Robert Richin. Robert learned about fabrics from his father, Sidney Richin, who was a women's clothing manufacturer and retailer. Robert would scour the factory floors of top designers to find the fabrics he needed to fill his stores. Robert's first store was a 2000 square-foot building, located in Manheim, Pennsylvania. The fabrics came in on rolls and were folded into remnants. Theses fabrics were displayed on tables and hung on hangers. After 10 years of opening his first store, he opened seven more stores located in Pennsylvania and Maryland. The stores featured fabrics from leading designers and manufacturers such as Jonathan Logan, Butte Knit, Leslie Fay, John Meyer, Jones New York, plus many more. During the 1990's, he started a swatch club where customers received monthly swatch mailings containing about 30-40 different fabrics. 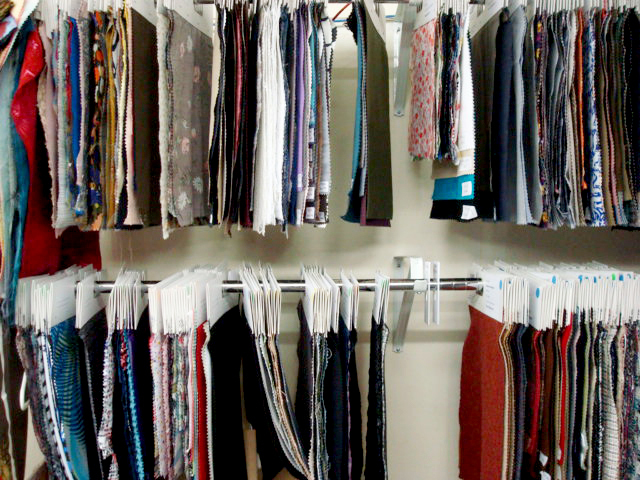 Inside the store while it was being remodeled to be filled with the latest fashion fabrics. The store is still filled with great finds! A good value for a good price! About 12 years ago, they decided to start a website, FABRICMARTFABRICS.COM. Instead of sending out a general mailing of swatches, the website gave customers the ability to display 1000's of items and present them to a larger customer base. What is FABRICMARTFABRICS.COM all about? 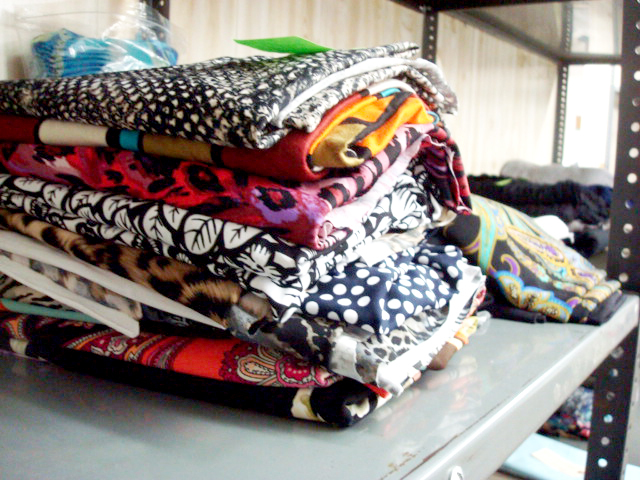 1) It's about providing customers with a large selection of quality fabrics at incredible prices. 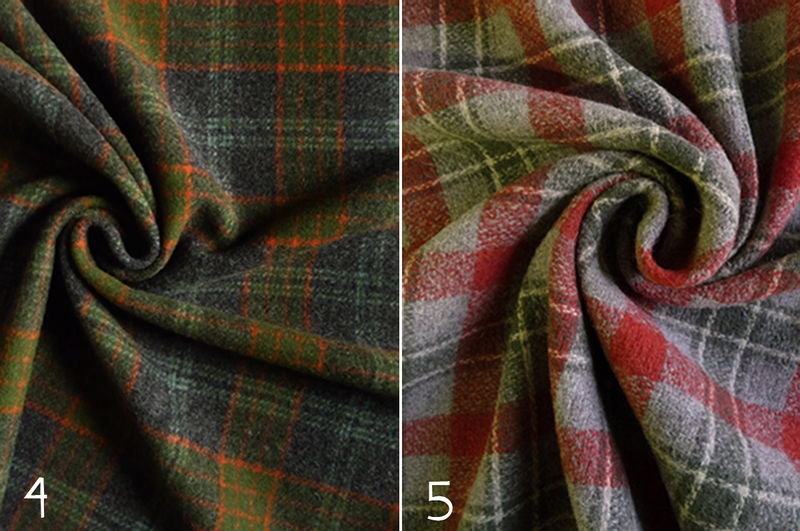 2) It's about having a website that adds new fabrics everyday. 3) It's about having Super Sales, Clearance Sales and $1.00 Blowouts! 4) It's about having an exciting and fun website. 5) It's about having a site that customers want to check out every day. 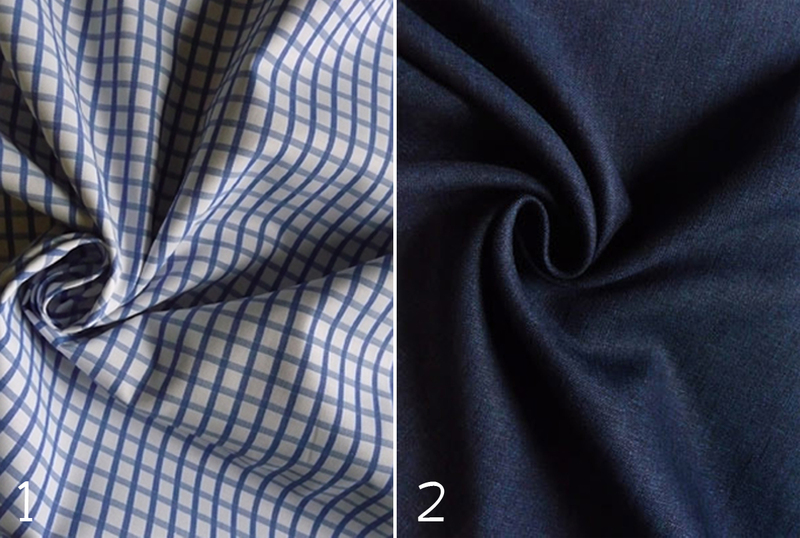 6) It's about picking the best fabrics from dozens of sources and bringing them to you, the customer. 7) It's about having the best pictures online. 8) It's about having the best people cutting and packing the orders. 9) It's about shipping the orders within 24 hours. 10) It's about having the best customer service. 11) It's about having employees that care and enjoy what they are doing. 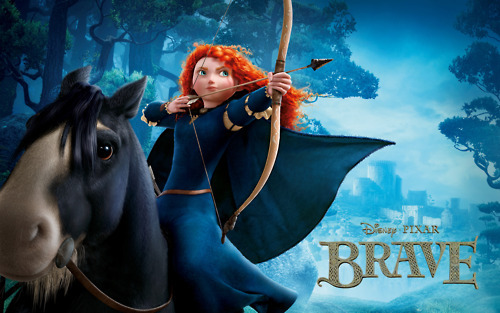 12) IT'S ABOUT EXCEEDING THE CUSTOMER'S EXPECTATIONS! The cutting counter and store being prepared. Today we have a computer inside of the store for customers to use to shop our online store, in store. 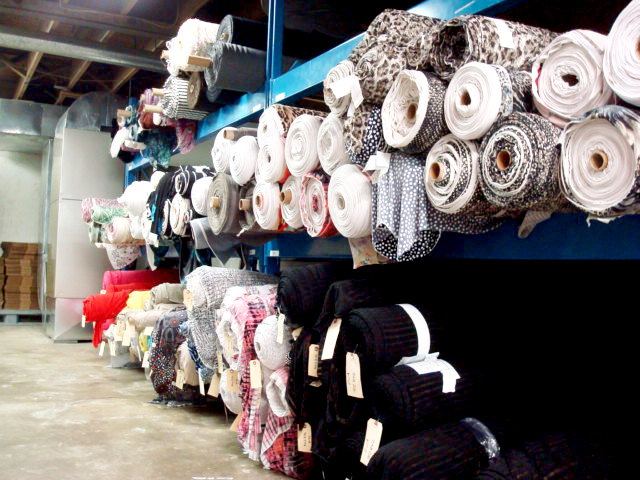 This makes it easy for customers to look up fabric prices, content, uses, and feel the material while browsing the fabric from the website so they can purchase it right at our location when they visit us. Want to know more? Just ask and we will answer! Email us at fabricmartblog [at!] gmail.com with your questions. so don't forget to keep checking back as you wait to view our tips and tutorials! If you've been looking through fashion magazines or perusing the racks at the mall, you will find that sequins are in! Whether it is a simple tank turned glitz or a complete head to knee dress, sequins are there. 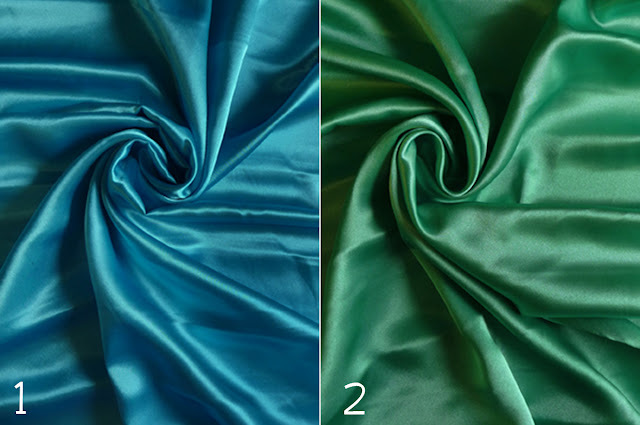 Fabric Mart is pleased to offer a few sequined fabrics for your choosing. If you're not sure you can bear wear sequins on your body, try an accessory. Accessories are always a great way to try a trend that you're not totally comfortable with. 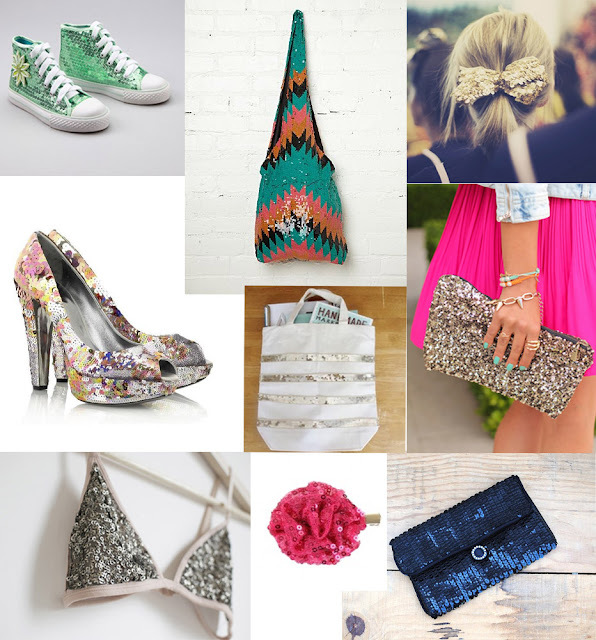 Check out these fun accessories that you can make with the sequin fabric on our website. I recently came up with a new way to organize my fabric stash. I'm sure its not a "new" idea, but I really like it and have tried it out and it really works! 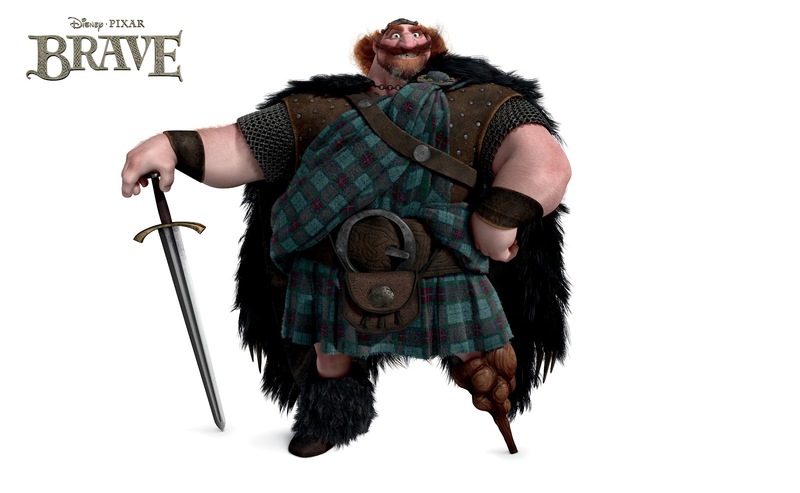 I posted this in my Julie's Pick January 2012 newsletter and will now share it with the world. A new year always brings about new ideas on how to organize your life. This year I would like to organize my fabric and sewing supplies. I just got married in August and moved, so it was about time that I do this. I have a closet full of fashion fabrics, a big tub of woolens, 2 plastic drawers full of more fabric (fashion and quilting) and a section of another closet filled with quilting cottons. Plus I have a few bins of fabric that my parents just brought over to my house! So I had to figure out a way to organize all of this. 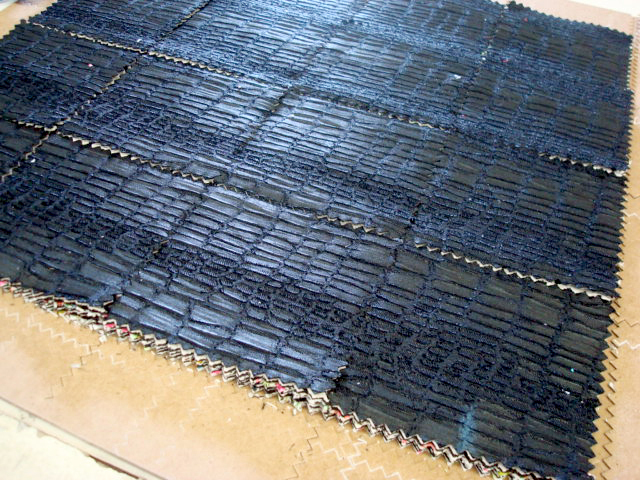 I first started with my fashion fabrics. I took everything out of the closet it is stored in and measured each piece. While doing that, I cut a small swatch and stapled it to an index card. Then I labeled how many yards I had, the content, and the width. I also tried to write down when I bought the fabric and if it had a specific designer. In the top left corner of the index card, I wrote the "category" -- silk, linen, cotton, knits, lining, woolens, etc. I used a different color marker for each category. Then I placed all the cards in a file box with tabs labeled by the color of the category. I ended up having 2 file boxes because the linens, woolens, rayons and others did not fit in my first box. Now when you are ready to figure out which fabric to use for your next project, just get your pattern, your file box and start designing. This is also helpful so you don't have a "fabri-lanche" of fabric falling out of the closet on you! You just grab one fabric out of your closet rather than sifting through the piles and piles of fabric. Have Fun!! Supplies Needed: Scissors, matches or lighter (if you need to identify the content), file box(es), file tables, index cards, variety of colored markers, pen, stapler, and of course your fasbric stash! 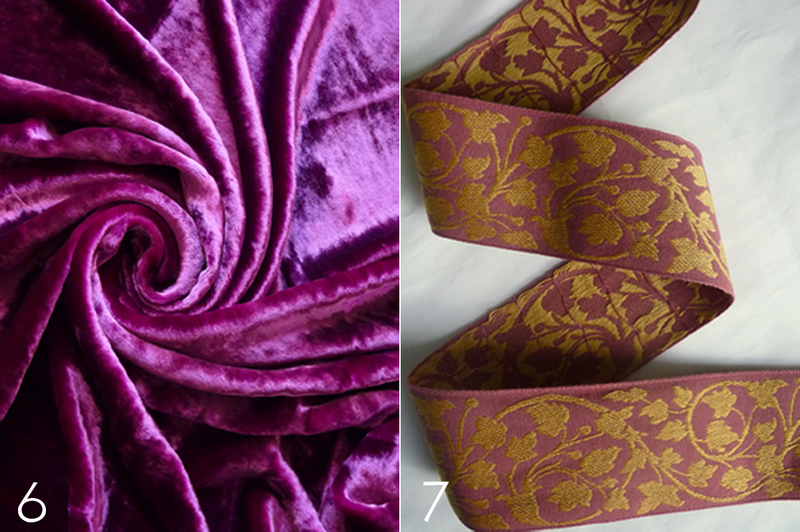 Now that I've gone through the process of selecting the fabrics (using the card system) that I will use with my pattern, I've added a few other ideas. - If you do not use the entire amount of fabric, cross out the original yardage and write what is left. Then put your fabric back "in stock". - If you have a HUGE stash and have a hard time finding your fabrics, you could mark on the cards what shelf or container it is stored it. Then you would also have to label your shelves or containers with a symbol. - Write down if you've washed the fabric or not. I usually try to wash it as soon as I get it, but some fall through the cracks. 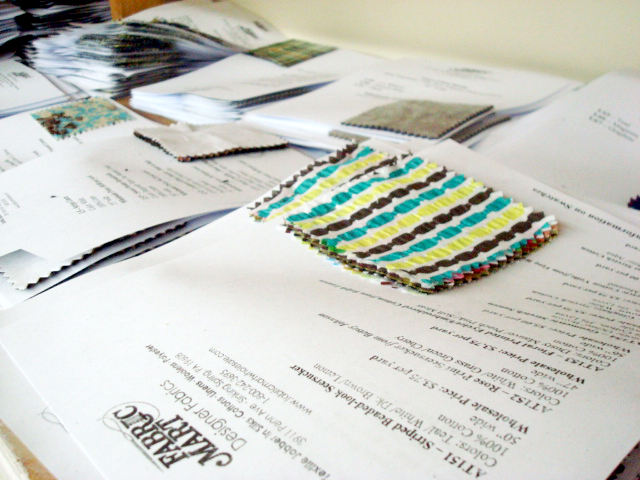 Sometimes at Fabric Mart we have a little time to experiment with our fabrics and trims. 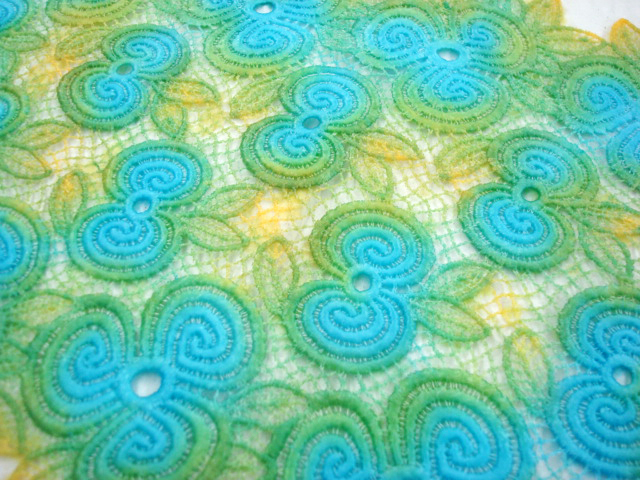 I spared a few minutes in between tasks to experiment with dying our Venice lace. After yesterday's post my mind was still on lace all morning and I couldn't wait to put our cotton lace to the test. We currently only have a few cotton laces online. But any cotton or rayon lace will do! 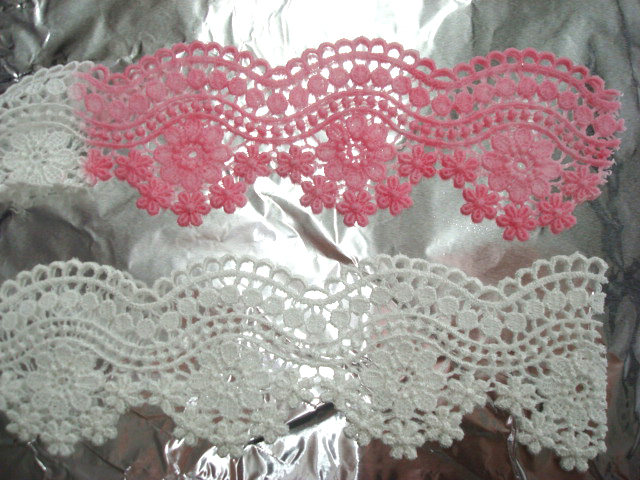 I chose to make my lace trim pink. Because pink and lace is the best thing I could think of! I first laid a piece of aluminum foil on the table to keep the dye from roaming the table top. I used a paper bowl to mix my color in. I little dye goes a long way! But the cotton will absorb it very quickly. 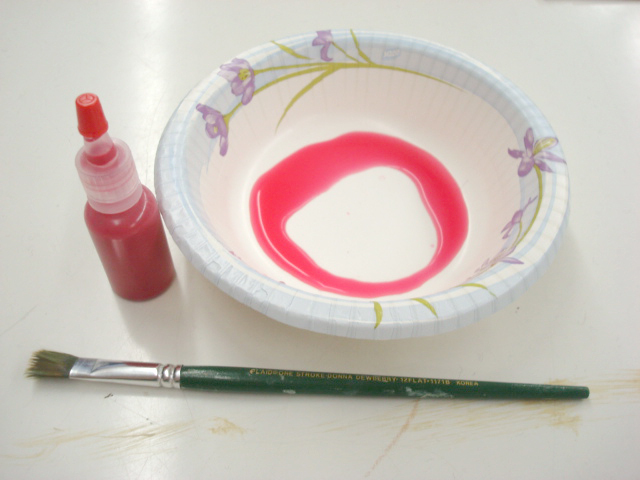 To make the lace pink I pour a small amount of water into my bowl and then added about 5 drops on red dye. I used a paint brush to apply the dye. Using a brush prevented making a big mess but it did cause the dye to be applied unevenly, but it still worked rather well. 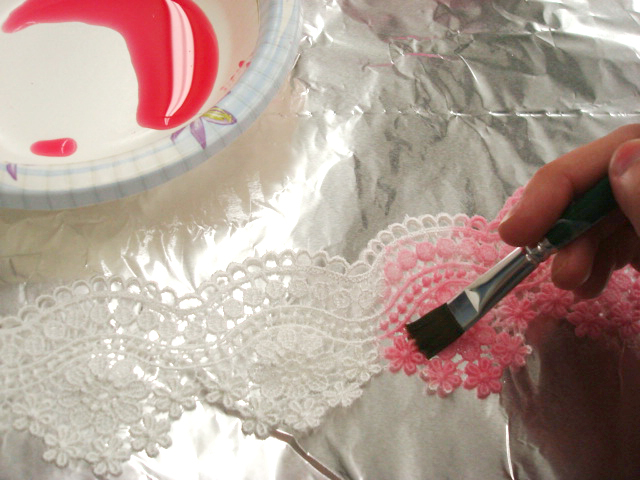 I was having so much fun with this process I then attempted to paint the lace with the dye. I chose to use blue and orange dye for this challenge, blue for the flowers, orange for the leaves and the background. While applying the orange dye the colors ran together and left me with a funky tie-dye look. 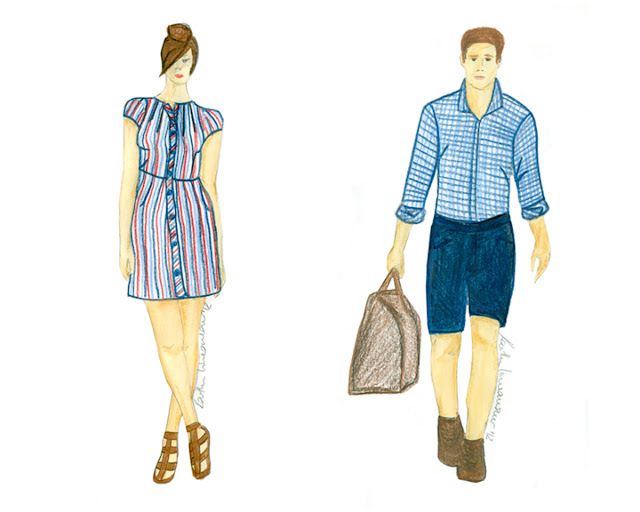 They are both a cotton/rayon blend. I am currently obsessed with lace and luckily Fabric Mart is filling my craving! 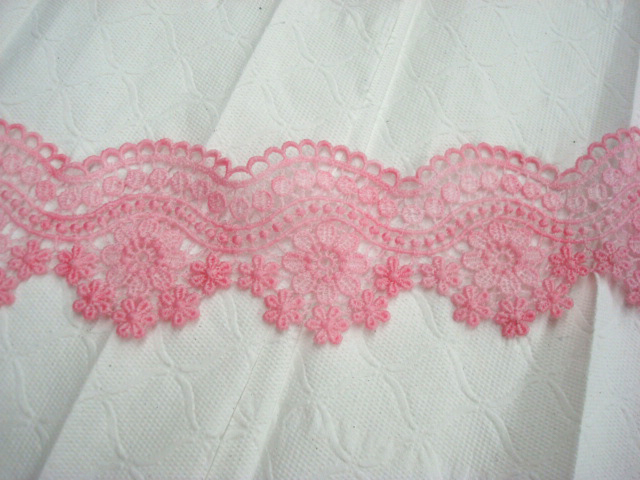 It is paradise here with all the new lace trims online and the beautiful lace available for wholesale. (Didn't know we did wholesale? I've been swooning over my options and decided to take some time to peak around Pinterest for ideas. I found so many adorable ways to utilize the new trims on our website. Venice lace is absolutely gorgeous, but big projects can get a little pricey. 1. Lace Cuff- Make your own using a piece of lace and fabric stiffener! 2. Give an old scarf a fresh look with a touch of lace at the ends! 3. Add a little lace to fancy up your high heels! Just apply with a bit of fabric glue. 4. Sweeten your favorite denim shorts with lace patches. 5. Trim your plain long sleeves with a taste of elegance! 6. Create a beautiful place to hang your jewelry with a recycled frame and a few pieces of lace. 7. 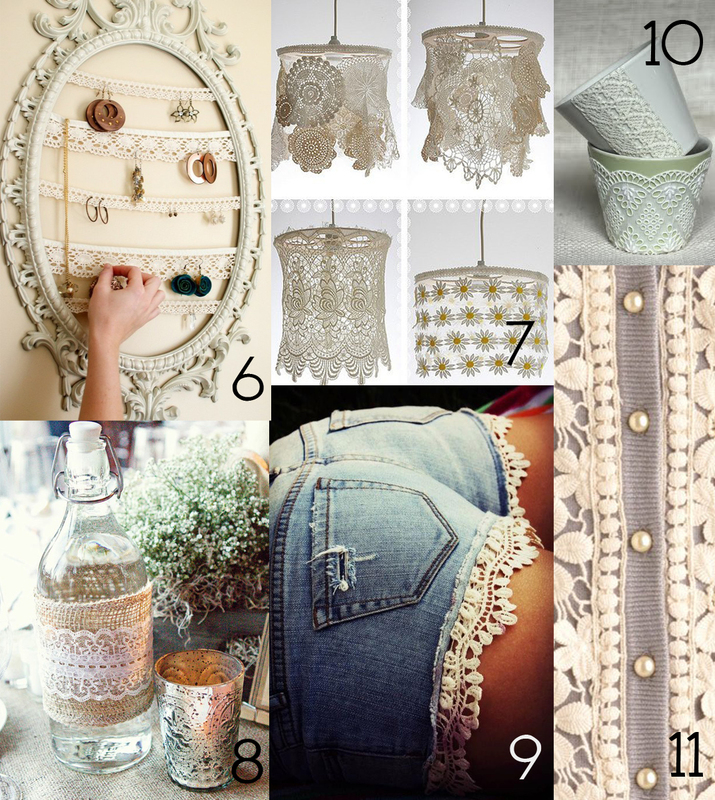 Make little lace chandeliers by attaching lace to a wood hoop. 8. Decorate your tabletop with a strip of lace wrapped around a bottle or candle. 9. Revive your favorite old denim shorts with lace trim. 10. 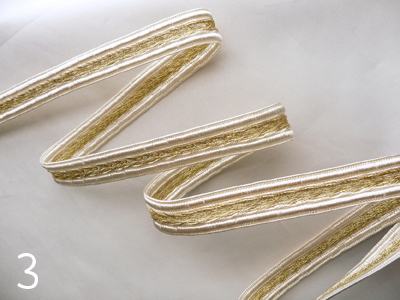 Wrap lace trims around candle holders, flower pots, vase, etc! 11. Make over a boring cardigan with trim on either side of the buttons! A wallet was given to me for Christmas this past year and it has gotten some heavy use. Thus an idea began to blossom. Perhaps I could make another? It would make a wonderful gift for others as well, so I had to give it a go. So I waited for a rainy day and the patterning began! After about 20 minutes I had a new wallet. It was so simple I had to share it with you. Enjoy! Step 1: Find fabric and cut out pattern. Cut one of each pattern piece in the lining and outer fabric. The nice thing about this wallet is that it is easy to create a pattern specific to your needs. You can make this bigger or smaller as you please. Here are the dimensions I used. Step 2: Making the pockets. With right sides together, sew the straight edge (shown here at the bottom of the photo) at a 1/4 inch seam. 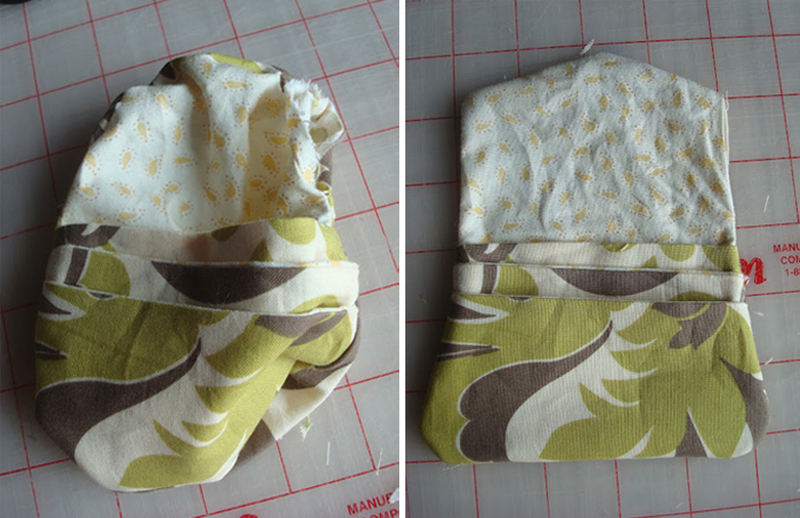 Sew each of the 3 pockets in the same fashion. At this point you should have 3 pockets and the two pieces that will make the back of the wallet. Step 4: Stack the pockets. Smallest on the top and the largest on bottom. 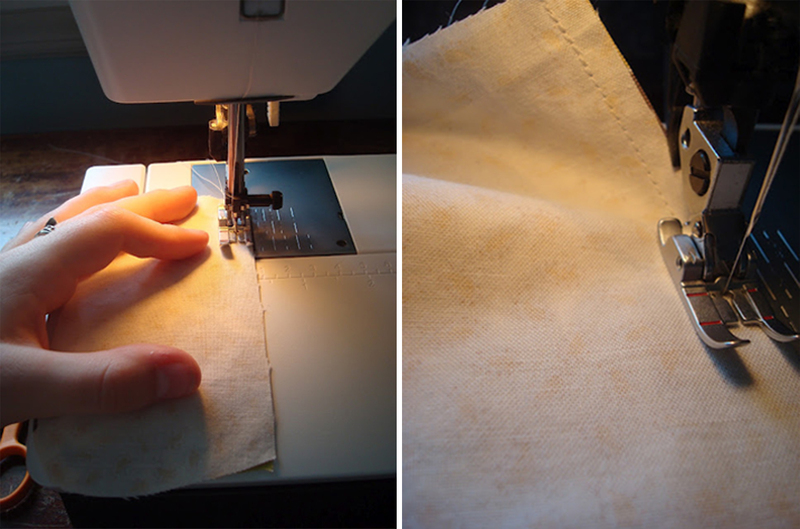 Step 5: Place the pockets, right sides together, on the outside pattern piece. Step 6: Place the lining piece on top (right side face down). Step 7: Pin. Make sure you leave the space between the double pins open (so that you can flip the wallet right side out). Step 9: Trim seam allowance. Step 10: Turn inside out. And now the big finish! Stitch the hole closed. A nice slip stitch will do nicely. There now, a finished wallet. What a pleasant thing! Another color? Sure! This wallet was made from one of the lambskin hides (previously available on our website.) Being such a soft supple leather, I added a button to the front to help hold the flap down. I also neglected to put in a lining (which called for a few pattern alterations), though now I think the leather could have benefited from a little stiffness provided in the lining. Still, it's an adorable wallet and I consider it a success. I hope you are inspired! Run off and experiment! It is often the most important part of the process.